“just” – does that word cause you to pause? It should. One person’s “just” may be a significant challenge for someone else. As in “just tell him “no” – when you want your child to stop doing something that may be dangerous. Depending on the child, that may or may not be a simple solution. Something that challenges me down to the very fiber of my being, may be “just climbing down a cliff” to someone else. 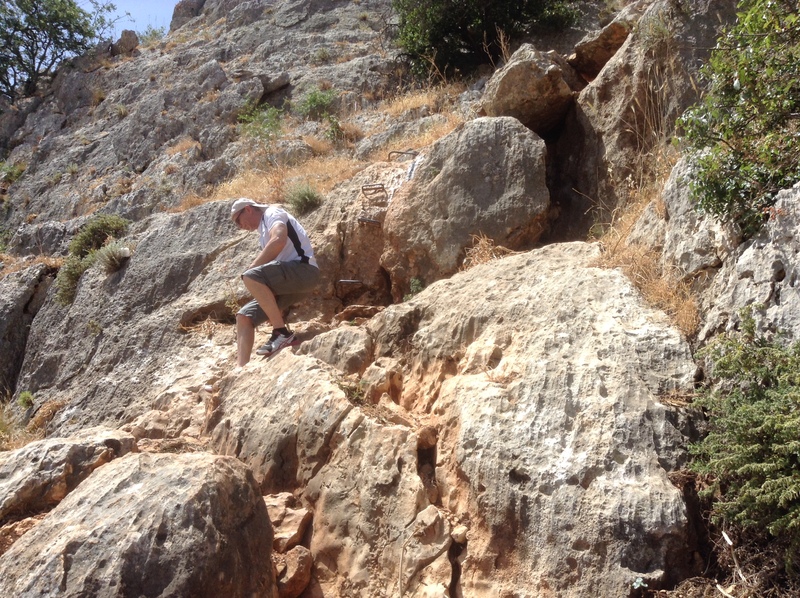 While in Israel, the main quality of the topography that Phil and I noticed were the rocks. (This is besides everything being very dry unless it is irrigated.) Rocks were everywhere. In the ancient sites and ruins we visited, the buildings were constructed of rocks and are therefore still visible. This makes perfect sense because rocks are in such abundance and people throughout history use what is available to construct dwellings. After seeing rocks everywhere, it should have come as no surprise that our group would be asked to descend a rock formation. Yet, Elaine and I WERE surprised! We had hiked up a steep slope through brown grass that was sprinkled with flowers, startling in their beauty because everything around was so brown. The end of our climb was a spectacular panoramic view. This mountain was called Mt. Precipice. I looked up the word precipice – it means – a very steep rock face or cliff, typically a tall one. The name was so appropriate and should have been a clue of what was to come. The path James led us to was straight down! You can see from the photo that I am not exaggerating. We were told that morning before we left that there were some “rocky bits” and “one strenuous part.” We had been on rocky bits the whole trail. I should have know that when James said “strenuous” it really would be. 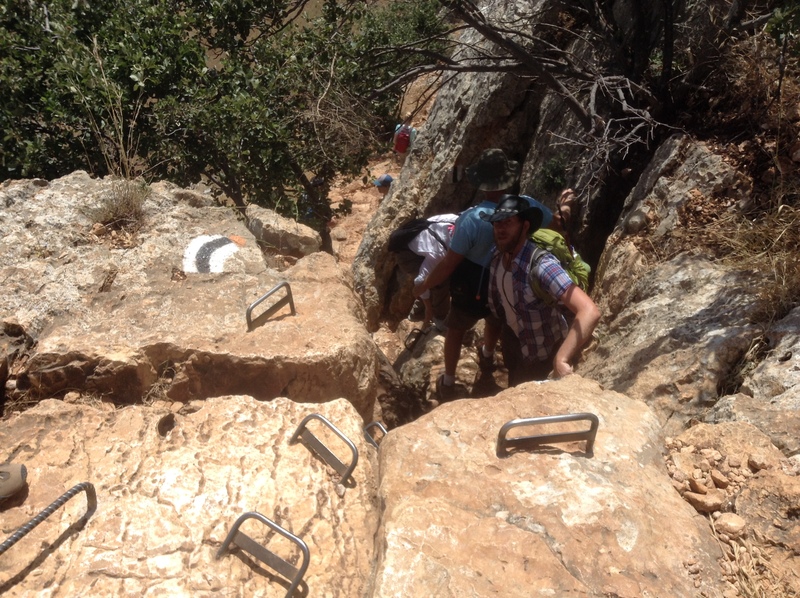 There were large iron staples embedded in the rock face to hold on to and step on as one climbed down. I watched as the others started descending first. I was so proud of Elaine! What a trooper! She went down from hand/foot hold to hand/foot hold, step by step. As I watched Elaine descend, I knew I could as well. She went before me, making sure each of her steps was on sure footing. Elaine’s example gave me courage and encouragement to make the descent myself. My biggest concern was making sure my foot was securely on a staple before I put my weight on it and went down to the next staple. I wasn’t sure I could see the next staple. Phil went before me and when I needed it, he guided my foot to the next staple. Once I felt the staple under my foot – sure footing – I was fine. Needless to say, we all made it down in one piece. I have thought since then that this is a picture of our walk with God and how important the Body of Christ is. In life we come to those times where we are on a precipice, we are not sure where to go, or how to face what we see ahead. It may seem that there is NO WAY forward. Yet if we look around, God often provides someone who is going through something similar – right before us – and that person can support and guide us along the way. Seeing Elaine descend successfully, then having Phil guide my feet, prevented me from being paralyzed by fear or being left behind on the mountain. We can encourage one another as we walk with God, encourage each other to keep out feet on the Rock, our sure footing. I expected to see Jewish people, some from many different continents as the diaspora have returned to the nation of Israel since it’s modern establishment in 1948. I also expected to see many Arabs who have populated this region since their beginnings as children of Abraham’s son, Ishmael. What I did not expect to see was the many hundreds of Christian pilgrims from every tribe and every nation on earth. 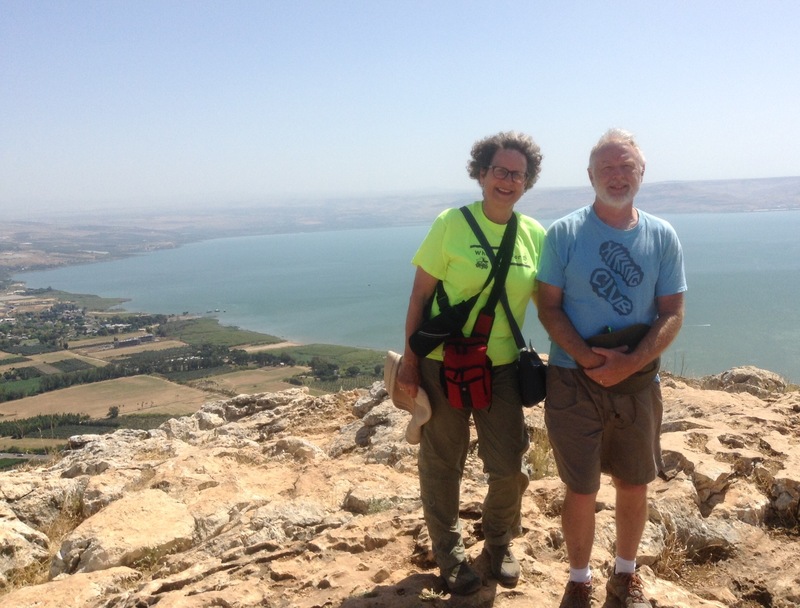 The second through fifth days of our trip were spent hiking the Jesus Trail. This is a well marked trail from Nazareth, where Jesus grew up, to Capernaum along the Sea of Galilee where Jesus spent most of His time in ministry. Our group of 10 people walked where Jesus walked and lived, seeing the locations of several of His miracles and the ruins of the occupying Roman government. This is not a heavily populated area and the people we saw were mainly Jews and Arabs, living in a delicate balance of religious and political tolerance. The next few days were spent mainly in Bethlehem and Jerusalem, visiting the many significant sights of Jesus birth, death, and resurrection. This is a modern urban area, surrounding the old cities of Bethlehem and Jerusalem. There were hundreds of people arriving on large tour buses at each site we visited. This is what surprised and blessed me. This is what I did not expect. All of these people came to pay homage to Jesus and the places where Jesus lived and and carried out His ministry. Why did this bless me so much? Why was I surprised to see people from every tribe and every nation worshipping Jesus, the King of Kings and Lord of Lords? I have to admit that my response revealed my narrow view of the Body of Christ and the Kingdom that Jesus will establish when He returns again to earth. In Revelation John shares the following vision. Seeing these large groups of people from nations throughout the world should not have surprised me. We were after all near the very location where the Bible teaches God created the first people. If I believe this Biblical account, and I do, then all the various people I was seeing had ancestors who originated here as well, just like I did. I was overcome by the blessing of seeing this very diverse representation of my brothers and sisters in Christ, the Body of Christ, the Church. Our church gatherings here in the United States are but a small representation of what God has gathered together in the Body of Christ world wide. My visit to Jerusalem gave me a glimpse into this much bigger picture. We looked different, dressed differently, talked and sang differently, prayed differently, even expressed our love for Jesus in different ways, but we had a common purpose. We were there in Israel to honor Jesus, the King of Kings. The rhododendrons are absolutely glorious right now. Several people have come by to see them because the bushes are just LOADED with blooms which also attract a multitude of butterflies. It is truly a feast for the eyes. 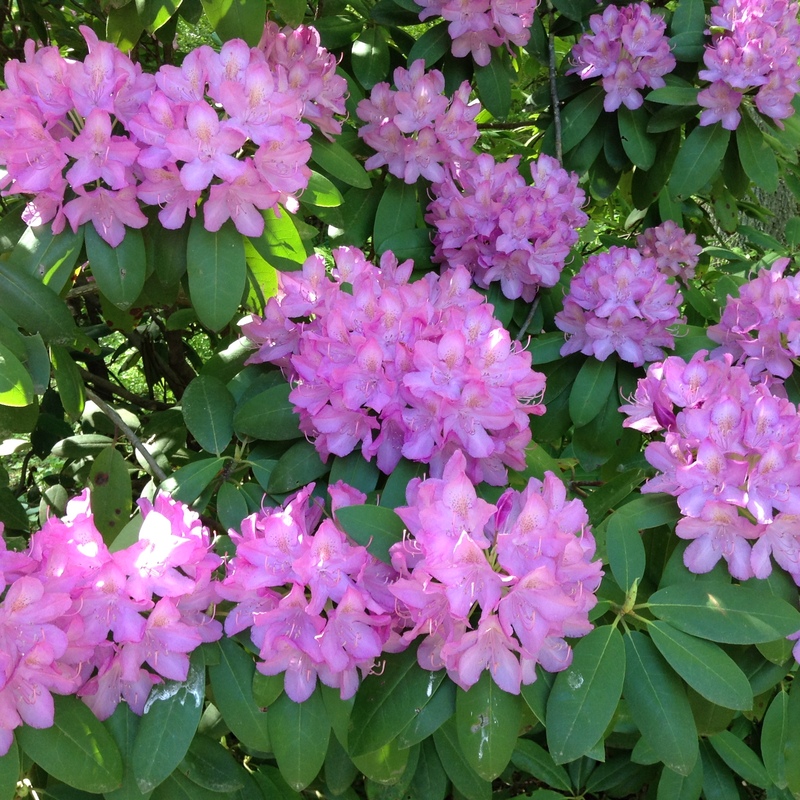 I did not plant these flowers – former owners Peggy Mason and her husband Charles did. I did not plant the large white pine trees that tower over these bushes providing the right amount of shade as well as their needles for added mulch and acidity. The only thing we ever do to these lovely plants is cut off the dead branches. These dead branches are not only unsightly, but they can harbor insects or disease that affects the plants’ health. I have had to cut out lots of dead branches on other plants as well this spring. The late freeze caught several of our hydrangea which had started to bud in the unseasonably warm winter. But then….ZAP! I was often disheartened as I cut off the results of frozen buds and long stems that only days before had held the promise of big blue blooms later this spring. Yet when I stood back and looked at the end result….yes! The trimmed plants did look much better. God wants to cut off the old “dead” parts of our lives. 15 “I am the true vine, and my Father is the gardener. 2 He cuts off every branch in me that bears no fruit, while every branch that does bear fruit he prunes so that it will be even more fruitful. Notice the reason God, the heavenly gardener, cuts off a branch – “so it will be even more fruitful”. God allows things to be taken from our lives so that the things that remain are more effective. When I cut the blooms from most annuals, the plant will produce more flowers. 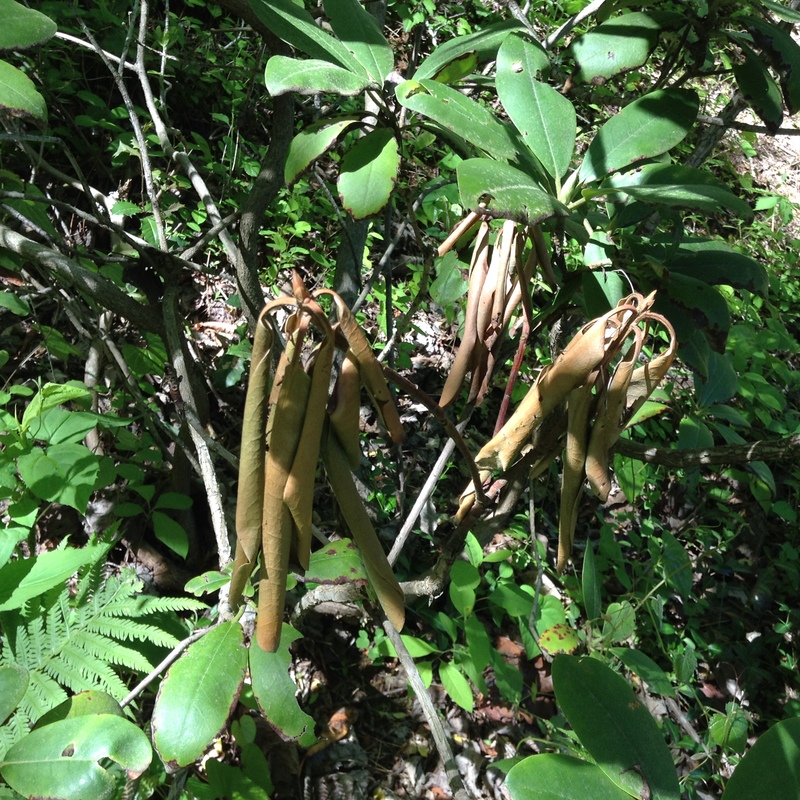 If I leave the blooms on the plant, they die on the stem and go to seed. There are no more flowers. Sometimes we think we are the only one who knows what is “dead”, no longer producing fruit, in our lives. We must trust as God cuts off the dead things in our lives so that new growth can flourish. i remember the sadness I felt when my opportunity to help lead worship ended. That was something I loved doing. Now I worship with the congregation and I love being able to focus entirely on worshipping God, not the next cord, song, or when to stop, etc. God has allowed me to participate in ministry opportunities I would never have dreamed of doing earlier in my live. I tbelieve these are “new growth” resulting from His pruning.